Update, January 30: The latest Destiny 2 update is live, including the new Iron Banner event and some reward reworks. Last week, Bungie outlined a host of changes to Destiny 2 including better raid rewards and armor masterworks, and today that update has gone live – along with the latest edition of the Iron Banner. Keep an eye on what’s coming with the Destiny 2 update tracker. For Iron Banner, the game mode this time around is Control, and you’ll need to speak to Lord Saladin to begin. You can find more details about what expect in our Iron Banner guide. You can get all the details from the full patch notes, or get a little more philosophical about the changes with Bungie’s announcements below. Original story, January 25:The latest edition ofThis Week at Bungieis here, and with it, details on what’s soon to come in Destiny 2. That includes details on the next Iron Banner event, as well asmore changesto the game’s rewards system, including some sweeping adjustments to raid rewards. Clearing prestige raids now gives you both prestige and normal rewards. Raid encounters are now always drop a raid piece, and every one of those encounters has a chance to drop an exotic. To give players something to “chase” with the rest of raid items now being a bit easier to collect, there’s now a new exotic raid Ghost called the Contender’s Shell, which has a chance of dropping in the final encounter of either Leviathan or Eater of Worlds. The shell provides you with a Seeker of Brilliance perk, giving you a gradually increasing chance for a Bright Engram to drop. The Seeker of Opulence perk gives raid exotic drops a 50% of guaranteeing a drop you don’t already have. These perks are only active on Leviathan and the raid lair. The Iron Banner returns this Tuesday – this time it’s Control mode – and Bungie have a few changes in store for how the PvP event will work out. Season 2 weapons will naturally be part of the next event’s Engrams, but more significantly Bungie are adding way to directly purchase new gear from Lord Saladin, including armor and three different weapons. Armor Masterworks will be part of the next update, with all Legendary armor having a chance to drop a Masterwork variant. 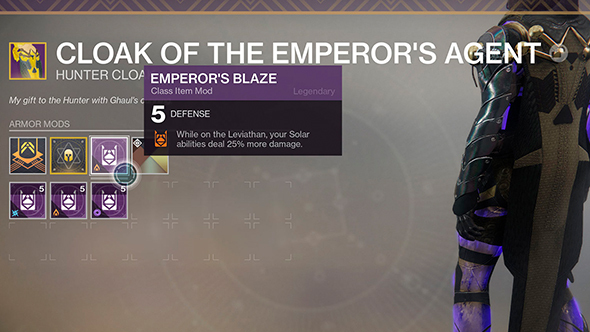 As with weapons, you’ll have a higher chance at Masterwork armor from Trials of the Nine and raid activities, though you’ve still got a chance with regular engrams. Each armor piece grants 3% damage resistance during supers, stacking up to 15% for a full set. You’ll be able to rework your Masterwork armor to a different stat package for one Masterwork Core and 10 Legendary Shards.